February brings more of Seattle’s rising star comedians to the Feedback Lounge for our “Just Laugh It Off” Comedy Series. 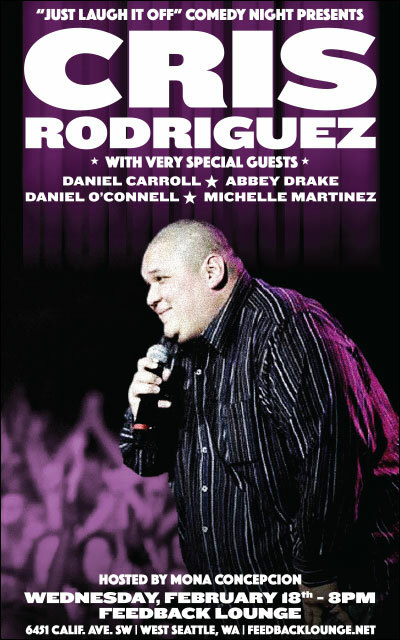 Joining Cris are fellow ace rib ticklers Daniel Carroll, Abbey Drake, Daniel O’Connell, Michelle Martinez and hosted by Mona Concepcion. 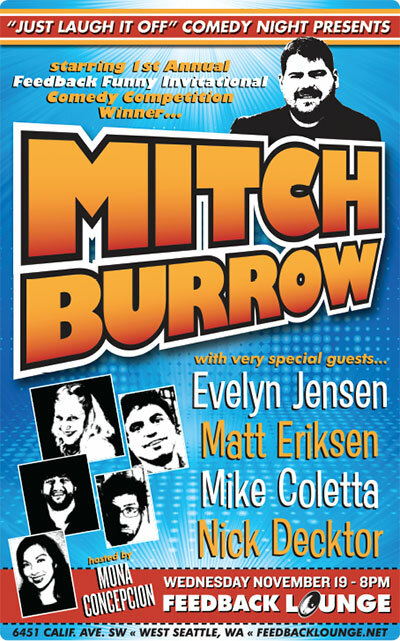 As always, no cover, so come enjoy some of our craft cocktails and be thoroughly entertained by these exceptionally talented comedians. 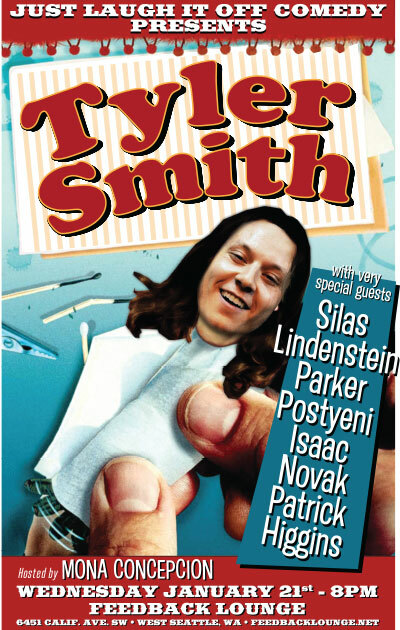 What another awesome line-up of rising star Seattle comedians: Tyler Smith, winner of the Northern Lights comedian competition in 2012, headlines along with very special guests Silas Lindenstein, Parker Postyeni, Issac Novak, Patrick Higgins and Mona Concepcion. In post-legalization Seattle, standup comic/pot enthusiast Tyler Smith’s new cooking-with-pot show, Something’s Burning, channels his abiding love for weed into a how-to series that’s equal parts entertaining and informative. With his veteran comedy chops and his, ahem, passion for the subject matter, it would be hard to imagine a better-equipped guide to lead viewers into the new and uncharted territory of legal, edible marijuana. In just over a month, Something’s Burning has gotten well over a quarter of a million views on YouTube™. Wanna see more? Click HERE. Time to pop the champagne and/or Budweiser – our JUST LAUGH IT OFF COMEDY NIGHT series celebrates its one year anniversary on Wednesday, September 17th, 8PM with a stellar line-up of terrific and funny rising star comedians. 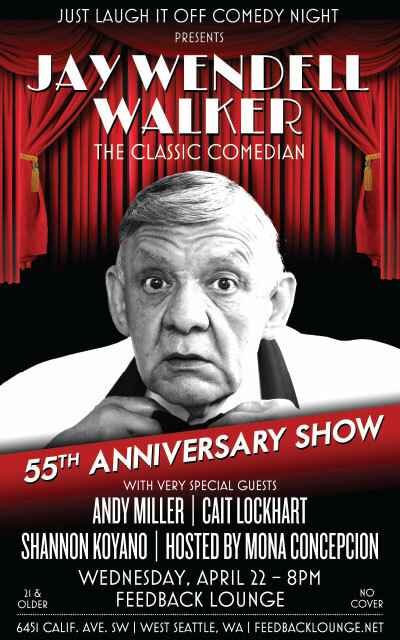 As always, this is a free show. 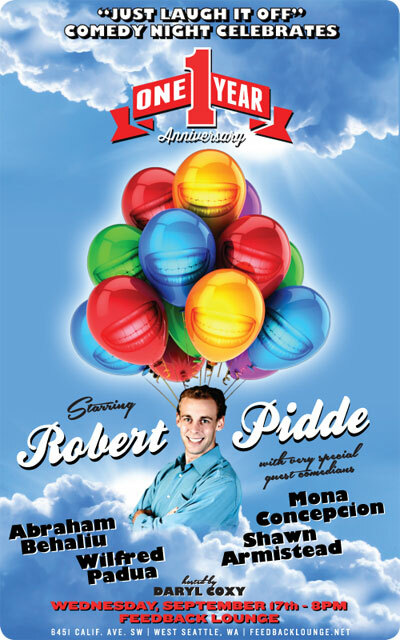 Headlining the show is stand-up comedian/actor/writer ROBERT PIDDE, with very special guests MONA CONCEPCION, ABRAHAM BEHALIU, WILFRED PADUA and SHAWN ARMISTEAD. And let’s not forget our incredible host, DARYL COXY. 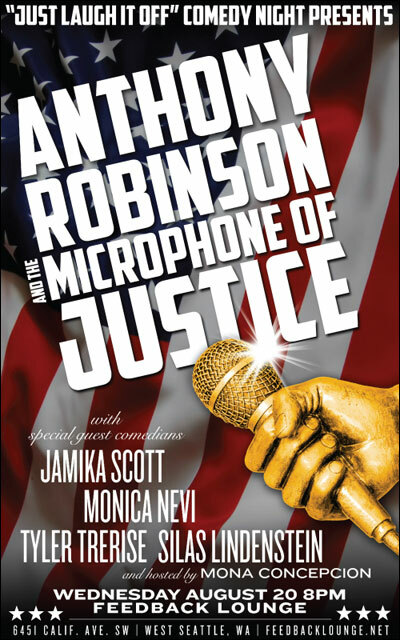 Time again for our monthly live comedy night, this time featuring the hilarious Anthony Robinson and his Microphone of Justice show. Anthony is joined by fellow rising star comedians Jamika Scott, Monica Nevi, Tyler Trerise, and Silas Lindenstein. The lovely and talented Mona Concepcion hosts this stellar night of comedy. Winner of the 2013 Punchline Comedy Competition in Seattle, Anthony started comedy on accident at a cafe in Kansas City during an open mic night in 2006. Not even wanting to be a comedian, one of the show runners asked him to display a talent at their open mic, and he wound up delivering what would be the trademarks of his comedy set for the past seven years: the combination of spontaneous brilliance and well written social commentary. Off the cuff, on the cuff, or even in handcuffs, Anthony Robinson is a good time.